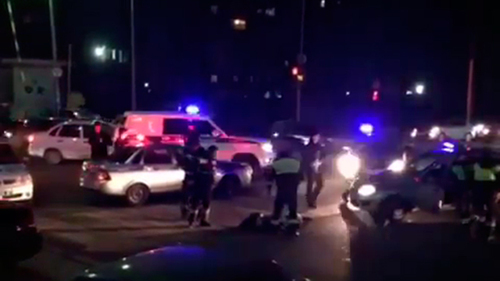 The attack on the DPS (road-and-patrol) post in Nalchik, in which four attackers were killed and a policeman heavily wounded, was the first armed incident this year in the Kabardino-Balkarian Republic (KBR) and the third one since October 2018. The “Caucasian Knot” has reported that in the evening on January 24, in the city of Nalchik, the capital of the KBR, four men attacked DPS inspectors. As a result, all four attackers were killed, and one policeman with knife wounds was hospitalized in grave condition. The previous attack on policemen occurred in the KBR on November 29, 2018. Then, according to law enforcers, when policemen tried to stop a car, people opened fire from inside thereof. The FSB reported that three extremists were killed in a shootout in the village of Maiskoye, another one was detained. According to sources, previously convicted residents of the republic aged between 20 and 31, who had been preparing attacks on law enforcers and kidnappings, were killed. The first armed incident in the KBR in 2018 after the shootout with law enforcers in December 2017 was the killing of a policeman in the Baksan District, whose body was found on October 3 in the village of Atazhukino. Investigators then reported that two suspects in the murder rendered resistance at detention and were killed. In recent years, the number of armed incidents in the KBR has been on decline. In 2015, there were 17 of them (with 47 killed and one wounded person); in 2016, there were seven armed incidents and one terrorist attack (14 people were killed and one wounded); and in 2017 – one incident with one casualty. This article was originally published on the Russian page of 24/7 Internet agency ‘Caucasian Knot’ on January 25, 2019 at 04:23 am MSK. To access the full text of the article, click here.